I'm a Florida girl at the core. I love blindingly sunny weather and wearing flip-flops all year round. I pledge to live out the second half of my life somewhere along a beach, and when I die, hope to be sprinkled across the sea. I also adore great citrus... and good Lord, Floridians know great citrus. I can't put into words the deliciousness of a blooming lemon tree... or how perfect life feels when a grapefruit is sweeter than an orange... or the joy I get from puckering my lips at the thought of key lime tarts. Living in Atlanta means I'm too far away to pick the oranges right off the tree, but close enough to get some real Florida citrus from my local farmer's market. I've been looking forward to those early spring months when Mother Nature tells us it's time to boost our immune systems with vitamin C. The powdery blanket of pollen which has turned all the cars in the parking lot a pale shade of yellow let's me know that time is finally here. A simple and bright, healthy dish... this tastes like Florida. To make the thyme oil, heat extra virgin olive oil in a medium sauce pan to 200° Fahrenheit. Add a few sprigs of fresh thyme and remove from the heat. Allow to cool completely and then store in an air tight container. To make the vinaigrette, add the minced shallot, red wine vinegar, thyme oil, and salt and pepper into a small container with a lid. Shake well until vinaigrette has emulsified. In a medium-sized bowl, gently toss the red watercress and a few whole leaves of cilantro and parsley together with a couple tablespoons of the vinaigrette. You want the vinaigrette to just coat the leaves, not drown them, so start with less and add more as needed. With a paring knife, trim the peel away from the flesh of the orange and both grapefruit. Cut both grapefruit cross-wise in about 1/4 inch slices, then cut the slices of white grapefruit in half. Cut the orange into segments, and place into a bowl with the grapefruit. Squeeze the excess juice from the orange into a small container. 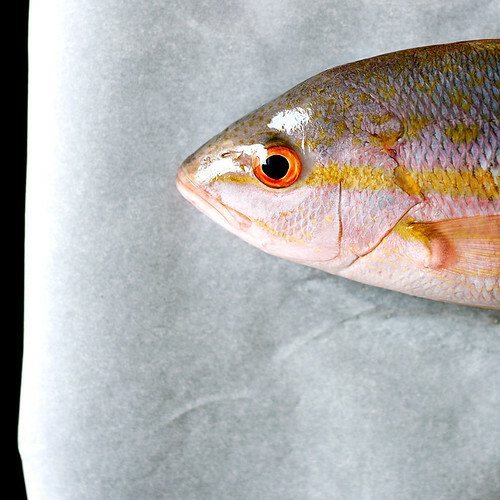 Pat the skin of the snapper with a paper towel or dry cloth to remove as much moisture as possible. This will ensure a crispy skin when pan-frying. Season the filets with salt and pepper. Heat 2 tablespoons of extra virgin olive oil in a large non-stick saute pan over medium high heat. Place the filets in the pan, skin side down. Cook for 2-3 minutes, or until the fish starts to turn slightly opaque. Flip over and cook for another 1-2 minutes, or until just cooked through. Remove from the pan and set aside. While the pan is still hot, pour the white wine into the pan and scrape up any caramelized bits with a wooden spatula. Add the remaining orange juice and stir to combine. Remove from the heat, and slowly swirl in the cold butter, one tablespoon at a time until completely incorporated. 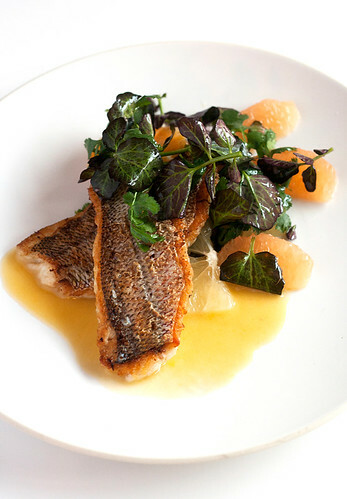 To plate, place the citrus on the plate and top with the snapper filets, skin-side up. 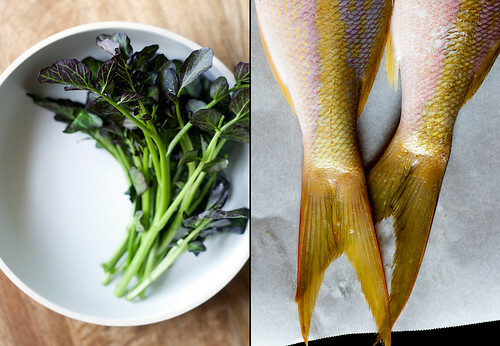 Place a small handful of the red watercress salad on top of the snapper, and gently spoon the white wine sauce over the filets. Hi Katrina, I found my way here through Twitter and glad to have done so. This dish looks delicious! I really like your About Me page too. :) Thanks for sharing this recipe! It's really an informative and well described post regarding a wonderful recipe of Yellowtail Snapper . I appreciate your topic for blogging. Thanks for sharing such a useful post. Fruits and Vegetables have very little calories and hence eating more fruits and vegetables instead of meats will quickly reduce your weight. Pascal Robagliia & Pascal Robagliia Moreover, some fruits and vegetables such as lettuce, zucchini are best eaten raw. Other Vegetables also require less cooking time to preserve its original taste and nutrients.